8kut is a 8 bands frequencies cutter freeware, designed with Dj's and live performance in mind. Cuts frequencies with the 8 pads, from bass to mids range, high mids and treble. Mac OS X 10.7 and latter. Add Save Changes control in the preset manager. Add Undo All Changes control int the preset manager. Add version info on Windows plugin files. UI new preset manager design. UI new Tek'it Audio light logo. BUG Cut frequencies was incorrect at some sample rate, solved. Numerous optimizations, reduced CPU by 3. UI Add new help/info icons. UI Add info and help pop­up menu. UI Improved preset zone design. This new version brings 8kut to Mac OS X in addition to Windows and add 64-bit support to both platforms. 8kut 2 comes with a "zero-delay filter" which sounds much clearer. The user interface has been redesigned to be bigger, cleaner and improve your workflow. Our free 8-band frequency cutter effect plug-in 8kut has been updated to version 1.4. 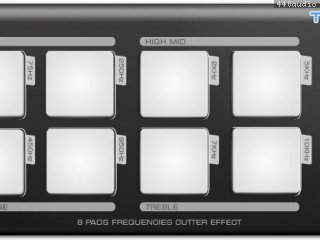 8kut cut frequencies with the 8 pads, from bass to mids range, high mids and treble, and is designed with Dj's and live performance in mind. Added Left and Right channels pass through. Renamed product to TA 8kut. Renamed .dll file to TA 8kut.dll. Added Author website URL to the note pop-up. GUI updated the info screen. SETUP Windows 8 compatibility layer.